AE600 Active EQ HD features AAX DSP compatibility for ProTools HD systems. Every fixed and active band in the AE600 has its own gain, frequency, Q, and mode controls. EQ mode options include parametric, proportional Q parametric, 5x Q parametric, Baxandall shelving EQ, vintage styled EQ, X-style shelving EQ, Baxandall shelving EQ plus filtering, and high and low pass filtering. 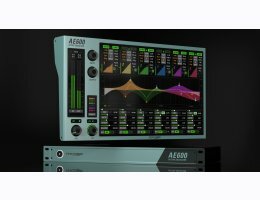 "Download the demo of AE600 Active EQ HD"